This sweet baby girl turned 1 Saturday and she had to have a birthday bubble. So her surrogate Mimi went to work. I love bubbles on little girls and thought this pattern would be perfect. I used ric rac to adorn the angel sleeve version. I made the 18 mos, because there wasn't a lot of difference in overall width from the 12 to 18. I thought she could use the extra length and make it last longer than a season. The smocking plate is "Happy Birthday" by Ellen McCarn. There were three candles on the cake in the pattern, but I used only one. I had to omit some rows to make it work for this little bishop. The colors are so bright and cheerful, don't you think? I'd definitely make this bubble again. It was really easy to put together. I used Martha's seamless pleating method and liked it a lot. I need more practice but it will become my new favorite method to pleat. Feel free to leave comments or ask questions below. 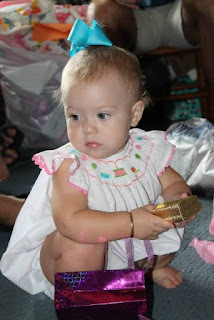 Precious baby and darling dress! Thank you Bunny. Bubbles look so cute on them at this age.